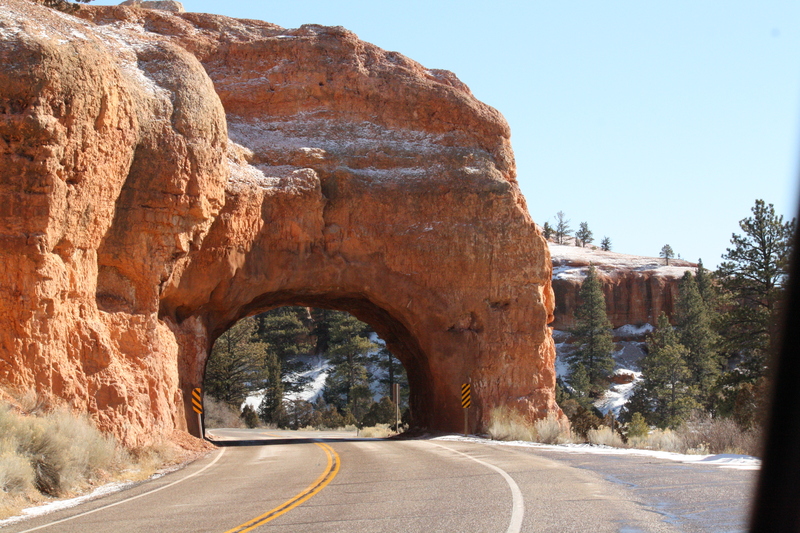 Bryce Canyon – Let's Go RVing! Wow, what a day. We woke up not sure where we were going so we went to the Visitor’s Center for guidance. We had decided to either go to Konob Canyon in Zion or Bryce Canyon State Park. Konob was an hour away and Bryce was two hours. We looked at the weather and decided what the heck, we’d go to Bryce today and Konob tomorrow. We left the campground about 9:30 and it took us over two hours to get to Bryce. The road out of Zion is constant switchbacks and many were icy so even slower than normal driving was in store for us. When we reached the tunnel we had to stop as there was a truck pulling an airstream in front of us. I would imagine they had to determine if it could fit through the tunnel. They proceeded with no problem and Jerry actually said he thought our coach could go through although he wouldn’t want to be driving on those switchbacks. No way! The drive to Bryce was nice, the scenery was nice but it reaffirmed my decision to stay at Zion. As we were arriving we went through Dixie National Park and Red Canyon. Oh my, what beauty. Unfortunately the Visitor’s Center was closed for the winter. Otherwise I know we would have stopped and checked that out. We went through two tunnels that looked almost like arches but surely there were bolstered up somehow. When we arrived in the town where Bryce was located nearly every business we saw had the name “Ruby” attached to it. They do have a monopoly it would seem. We continued on to the Visitor’s Center at Bryce where we looked around the gift shop and then got some recommendations from the park ranger. As we were exiting the building Jerry asked about lunch so we decided to ride back to the little town and get something to eat. We ended up eating at – well, guess where? Ruby’s. I had the soup and salad and Jerry had a burger and soup. It was underwhelming but we didn’t have many choices of where to eat. After lunch we rode back into Bryce and parked at Sunrise Point. 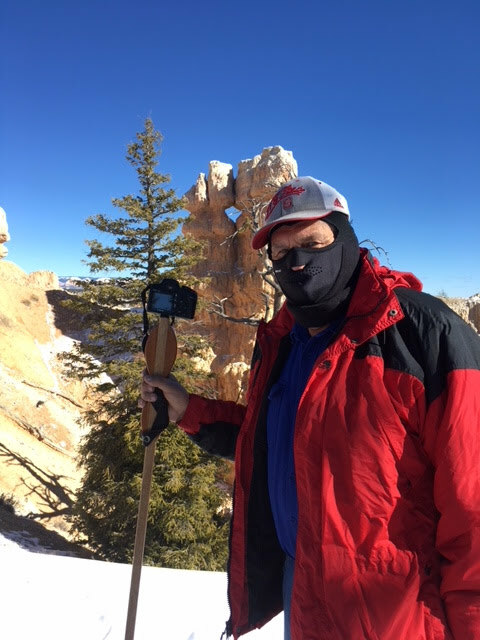 We were bundled up like Eskimo’s and I felt like the Pillsbury Dough Boy – and looked it! When we entered the trailhead we had the choice to go either left or right. We went left but think we should have gone right. Oh well, we just walked along enjoying the hoodoos in the distance. The trail was snowy and icy so we stopped and put on the spikes we had bought at Arches. They worked well as long as we were in ice but the intermittent snow and then red dirt (mud) clogged them up. We stopped a couple of times to clear them out and then just decided the heck with it and took them off. They had really made walking difficult and the entire time we were walking it was uphill. How can that be? Finally Jerry mentioned that we had been on the trail an hour and a half and we needed to turn around and head for the car. I was sorry that we didn’t see any specific point but agreed that it was time to turn around. In addition Jerry’s feet were wet and cold. I had worn my hiking boots but he had worn tennis shoes and walking in the snow had gotten his feet pretty wet. We saw some awesome views of hoodoos and were actually pretty close to them. The panoramic view was beautiful and so diverse. To the left one could see the snow covered mountains. 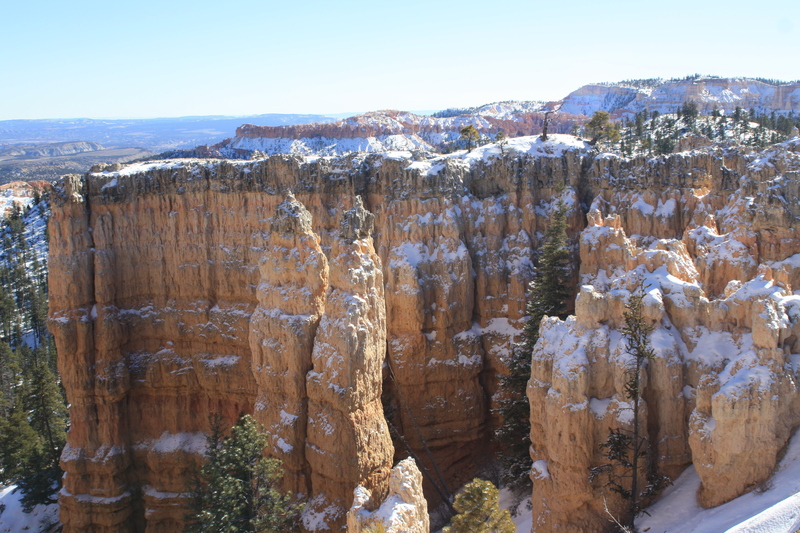 To the right were the snow covered trees and then right in the middle were the huge hoodoos. Our walk back went much quicker most of it being downhill and I surely was glad to see my little red Jeep. As soon as we could get in the car we started on the 17 mile scenic drive. Instead of stopping at each site we rode onto the end first. The elevation at Rainbow Point is 9115. For a couple of flatlanders from 43 feet above sea level 9115 is mighty high. Interestingly enough although most of our hike was at 8000 we didn’t have any problems. Perhaps we are getting used to the higher altitude. We stopped at Natural Bridge view point which is at an elevation of 8627. It really is misnamed as it is technically an arch rather than a bridge but boy, it is stunning. We stopped at a couple of other viewpoints also but it was getting so very cold and the wind was blowing as well. I have no idea what the real feel was but according to our car the outside temperature was 22 degrees! By the time we finished the loop road the Visitor’s Center was closed so we stopped at – yep, at Ruby’s where we bought the usual magnet and got a snack to carry us home. The drive home was simply put beautiful as we got to watch God’s stunning creation. As Jerry drove along the lonely highway I watched the sky with its pinks, mauves, sienna, grays and blues against a landscape dotted with snow and evergreens. As darkness descended the muted colors faded into shades of blue and darker grays. What a display of God’s handiwork. I was a bit anxious about running into icy conditions again but apparently all of the ice and snow in Zion melted today. Navigating the switchbacks in the dark was a bit scary but as usual Jerry did a tremendous job and got us back to the campground safely.